A piece of lead stilled forever her dancing feet. She loved pretty clothes, diamonds, lobsters and champagne, and, like Dot King and Louise Lawson, she learned how to get what she wanted. But then, like those later gay moths of Broadway, Dolly Reynolds paid with her life, and the mystery of her death was never solved. Now that more than thirty years have passed, can you explain the murder of the Belle of Mount Vernon? Why was she killed? Why was such a weapon used? Who killed her? Broadway is no older than its butterflies; no longer than the list of these beautiful young girls, whose dancing feet have at last become entangled in the dark ways of crime. Like Dot King and Louise Lawson, her latter-day counterparts, Dolly Reynolds fluttered awhile in the bright lights before she met a violent death. On the morning of August 16, 1898, the front pages of New York newspapers were devoted to Dewey’s capture of Manila, and the murder of Dolly Reynolds in the Grand Hotel at Broadway and Thirty — first Street. Who killed the pretty twenty-one-year-old daughter of a respectable Mount Vernon family, and why, was to puzzle private citizens, detectives, and district attorneys for many months. At nineteen, Emelyne Reynolds, nicknamed Dolly, was the belle of Mount Vernon. She was beautiful and she loved pretty clothes, jewelry, and champagne. A willing New York broker was on hand to provide her with these commodities. And it was not long before Dolly decided to leave her father’s house and live in New York. Her ambition ran toward the stage, but in the meantime she pursued the less glittering profession of book agent. When Dolly returned on visits to the parental rooftree, she often drove up in “a stylish trap.” Her clothes were fashionable. And there were rings on her fingers. But father and mother Reynolds were simple, unimaginative folk. They wondered a little how Dolly could afford to buy these things, and maintain her luxuriously furnished flat at the corner-of Ninth Avenue and Fifty-eighth Street, and why she preferred to be known at that address as “Mrs. 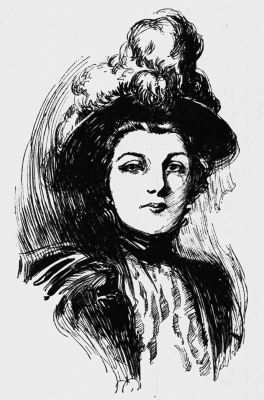 E. C. Reynolds.” But she had always been an independent young woman and they did not question her too closely; they were only glad that the book business was so good. It is doubtful if the beautiful brown-haired book agent ever sold many sets of “The Literature of All Nations,” in ten volumes. But she learned a lot about the prices of diamonds, lobsters and champagne. Dolly Reynolds had the combination of avarice and stupidity which usually characterize Broadway’s gay moths. And it was the prospect of making a fortune by a dubious race-track scheme that took her into the Grand Hotel on that hot August noonday. Carrying a black shopping bag tucked under the pink arm of her shirtwaist, she told the desk clerk that her husband would join her later, signed the register, “E. Maxwell and wife, Brooklyn,” and was assigned to Room 84, on the fourth floor. Miss Reynolds then ate her luncheon in the hotel cafe and went out. About 5:30 in the afternoon, she returned accompanied by a tall, dark man with a black mustache. And shortly thereafter a pint of champagne and two glasses were delivered on order to Room 84. At 7 o’clock, “Mr. and Mrs. Maxwell” went out, returning about midnight. Patrick Lenihan, the night elevator man, took them up to the fourth floor. At about 2 A. M., Lenihan was mildly surprised to see his mustachioed passenger descend the marble staircase alone — and leave the hotel. Night clerks have reason to be particularly interested in guests who walk out at such ungodly hours, and from behind his desk John Gregory took a good look at the departing profile. Nothing more was seen of the occupants of Room 84, until 10 o’clock the next morning, when, after repeated knockings, the chambermaid entered it. On the floor, between the center table and the lounge, lay the body of a young woman — her head in a pool of blood. The horrified maid gave the alarm. When the police arrived on the scene they discovered a curious weapon on the floor near the dead woman’s head. It was a foot length of lead pipe, crooked at one end, and wound with tire tape at the other. An iron rod had been fitted into the bore at the taped end. Bloodstains showed on the tape where it had struck the victim’s head, breaking her neck. She was fully dressed. There were no signs of a struggle, except for a turneddown stocking, the loosened buttons of her shirtwaist, and the fact that the lobe of one ear was torn, as though an earring had been unceremoniously removed. On the mantelpiece was a black shopping bag. An unknown hand had been in such haste to get at the contents that, rather than fumble with the catch, it had ripped a slit through the leather side. From cards and papers in the bag, detectives learned that the dead woman was not Mrs. E. Maxwell of Brooklyn, but Mrs. E. C. Reynolds of 370 West Fiftyeighth Street, from which address Dolly’s colored maid was brought down to the Grand Hotel, where she identified her mistress’s corpse. When the body was being prepared for the autopsy a bunch of bank notes and a check were discovered underneath the corset. There was only $9.00 in money, but the check was for $13,000. This slip of paper interested Captain McCluskey, chief of the Detective Bureau, exceedingly. It was drawn on the Garfield National Bank, payable to Emma Reynolds, signed by Dudley Gideon, and endorsed on the back by S. J. Kennedy. Down at the bank on Sixth Avenue and Twenty-third Street the cashier informed the detectives that they had no account with a Dudley Gideon, but they did have a depositor named S. J. Kennedy. He was a dentist, with offices at 60 West Twenty-second Street. When the handwritings were compared, the signature of the endorsement tallied exactly with that of the respectable dentist around the corner. Detectives then sought Kennedy at the oflice where he and his father practised dentistry together. The doctor’s answers were so contradictory, that he was conveyed to the Teni derloin Police Station, where hotel employees identified him as the man who had come to the Grand Hotel with Miss Reynolds — and left it , alone. None of Kennedy’s three different accounts of his movements on the night of the murder was satisfactory. His wife and baby being in Massachusetts, he said he had gone to Proctor’s Theater alone, but didn’t remember any of the acts on the stage. His story of how he then went home to New Dorp, Staten Island, where he lived with his parents, was an incriminating tangle of ferry-boats which didn’t land where he said they did; rides on trolley cars whose conductors denied his presence that night, and a four-mile woodland walk, that would have daunted a veteran tramper. Finally, Dr. Kennedy fell back on the time-worn excuse, “I don’t remember.” Except for the fact that he had put on a new pair of socks, and drunk one cocktail in the office, the dental mind was an abysmal blank from 5 o’clock Monday afternoon, until 7 o’clock the following morning, when he remembered being awakened in their New Dorp home. Pieced together fragments of paper found in the waste basket, matched pages in Dr. Kennedy’s prescription pad. The words “E. Maxwell and wife, Brooklyn,” written on it, tallied with his handwriting. Thus, said the detectives, had he instructed the young woman to register. The incriminating check was a form long discarded by the bank, and a book with the same kind of blanks was found in the doctor’s home. A piece of lead pipe which exactly fitted that of the murderer’s bludgeon, and bore corresponding cutting marks of a vise, was discovered in the Kennedy cellar. With the same deadly precision, an 8-inch dark stain on the inside of his right trouser leg, and on his newly purchased underdrawers, fitted the mark that such a piece of lead pipe would make if carried hooked on the drawers’ belt. And what was more natural than tire tape in the tool kit of so ardent a bicyclist as the doctor? Only one link was missing. The hotel employees agreed that the man they saw, had worn a straw hat, and although it was proved that Kennedy had bought a new straw hat on the afternoon of the murder, ‘it could never be found. Dr. Samuel J. Kennedy, a Jekyll and Hyde of real life. Why a man like Dr. Kennedy should have chosen that brutal weapon puzzled even the police, and led some people to believe that the murder had been committed by a desperate burglar. It was a thug’s billy. And a robbery had taken place in the hotel that night. Also there were the woman’s missing 3-carat earrings and rings worth several thousands of dollars. But the jewels came to light some time later, on a pantry shelf in the Ninth Avenue apartment, although detectives had previously searched the place; a wakeful woman who had occupied a room directly below number 84, further destroyed the “burglar on the fire escape” theory, and Dr. Kennedy was said to have kept even more sinister company than Dolly Reynolds. The police were interested to learn that he had been emulating the famous firm of Jekyll & Hyde. The devoted father, and respected citizen of New Dorp, was also a familiar figure in New York’s tenderloin, and a heavy plunger at race-tracks. He was said to have previously invested money for the Reynolds girl, giving her the worthless check as her share of the winnings. Presumably, Dolly went to the Grand Hotel to hand over more capital, since four days earlier, she had drawn $500 from her Mount Vernon savings account, telling her mother that she was going to meet Dr. Kennedy on Monday. He had told her to bring this sum in a satchel, she said, and he would have more money to put in it. Why her partner in beating the horses did not simply deduct the $500, if he really had further profits to give her, apparently never crossed her mind. The notorious room --- 84 of the Grand Hotel --- as seen by a contemporary artist. The police version of the real reason for that fatal appointment was that Kennedy took the girl to the hotel for the purpose of recovering the tell-tale check, whose presentation at the bank would mean his discovery as a forger. Failing to extract it by any other means, he had killed her. The slit bag, unbuttoned shirtwaist, and turned-down stocking, indicated that he had looked for it — but those search-proof corsets of the nineties had beaten him. 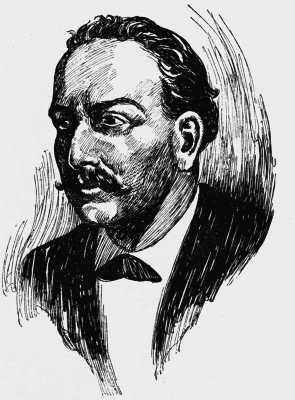 Dr. Samuel J. Kennedy was brought to trial for the murder of Emelyne Reynolds, before Justice Williams, in the Criminal Branch of the Superior Court, on March 22, 1899. His defense was a complete denial of the murder charge, and the handwriting on both check and memorandum. His lawyers produced numerous character witnesses from New Dorp, including the pastor of St. Andrew’s Episcopal Church. A rather vague woman testified that she had seen him in the Staten Island ferry-house at a crucial hour on the night of the murder. His weeping wife, and his 72-year old father, both took the witness stand and denied that the handwritings in question were Dr. Kennedy’s. All in vain. A level-headed jury listened to the iron-clad evidence presented by the prosecution, including a surprise ear-witness, who testified that from her hotel room directly beneath that occupied by “E. Maxwell and wife,” she had heard at 11:50 on the fatal night, the footsteps of two people, then the thud of somebody falling, and later only one person walking around the room. And after three hours deliberation, the twelve men brought in a verdict of guilty of first degree murder. Dr. Kennedy’s lawyers immediately began to work for a new trial, and in February 1901, this was begun. After it had lasted several weeks, the jury found themselves unable to agree. The State then decided to hold a third trial. Handwriting experts now testified both ways. And it was not surprising that after three years, some of the witnesses were dead, and others contradicted themselves. There were those among the jurors who felt that the prisoner’s identification was inadequate. Others thought the motive was insufficient, and the murder not premeditated. Kennedy’s good reputation in his home town impressed them. After twenty-one hours, they were still unable to agree, standing eight for acquittal, and four for conviction. And on June 16, 1901, a third jury was discharged and Dr. Kennedy was released on $10,000 bail. The surety was released in February, 1903, and about a month later the indictment for murder in the first degree was dismissed, leaving the man who had once spent twenty-one months in the death house at Sing Sing wholly free to cast his life in pleasanter places.